elk geval de eerste drie. Luister met plezier..
three on today’s menu, enjoy listening.. This entry was posted in Biguine, Cadence, Compas, Martinique by Moos. Bookmark the permalink. 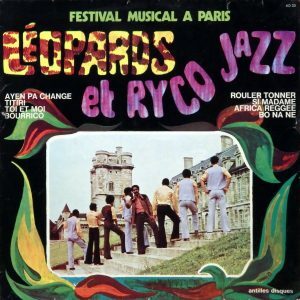 Do not Ry-co Jazz come from the DRCongo, or is this another lot? Ry-co Jazz – Jerry Malekani (guitar), Freddy N’KounKou (vocals), M’Bilia Casino (congas, vocals), Pierre N’Dinga (guitar), Panda Gracia (bass), Fidel Bateke (clarinet), Jean Serge Essous (saxophone), Chico Gelman (keyboards). Ry-Co Jazz from Congo (Brazzaville). They visited the Caribbean in the 60s and again in the 70s. Their music is said to have had an enormous influence upon the development of modern Antillean music. If memory serves Ry-co did do some cross-over stuff with French Caribbean, both francophone of course, they have elsewhere a wonderful track, if only for the title, ‘Tu bois beaucoup’. Leopards in great form, here … pouncing.